Bangalore is known as a high-tech and airpline hub, and we were ready for a dash of this promised "new" India. Luckily, Bangalore really did the trick. We were able to enjoy some modern conveniences and shopping before we headed further south. We found a hotel right in the thick of the shopping junction of MG Road and Brocade Road, the Empire Hotel on Church Street, which was much cleaner than the hotel we'd left behind in Mysore (though far from spotless). We enjoyed browsing (and restocking our reading material) in the many English-language bookstores in the neighborhood. We ate mainly Western food, even the dreaded KFC and McDonalds got their due, I'll admit. We went to a couple of malls, including one that had free wireless everywhere in the mall. Luckily, we had our laptop with us. We went to a couple of coffee places, used the internet, got laundry done, etc. We also succeeded in seeing two Bollywood movies in vastly different theatres. The blockbuster "Om Shanti Om," we took in at an old-fashioned single screen theatre, where we sat in the respectable balcony seats. The (mostly young, male) crowd in the "stalls" (i.e. the first floor seats) cheered and whistled with the entrances of Shah Rukh Khan and their other favourites. The ticket-taker was nice enough to tell us the movie was an "Indian film" Yes. "In Hindi." Yes, we said. "With no subtitles." Yes, we said, thank-you. It was really easy to figure out the story, and even easier to enjoy. 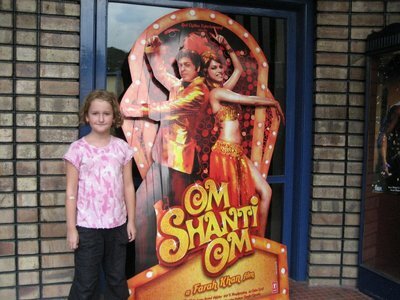 In fact, "Om Shanti Om" was the most enjoyable Bollywood film I've ever seen. Not so with "Saawariya," the other Bollywood film we saw, this one in a mall multiplex - very modern and clean, almost as nice as Hong Kong, actually - but the movie wasn't as good nor as easy to understand. Today we went on a long drive to Bangalore empire hotel, after a 3 hour drive we arrived in Bangalore empire hotel. Got checked in and saw our room. Very nice big bedroom and bathroom. after that we went and had lunch at ruby tuesdays (sort of like TGIFs) Then we were just walkind down when we saw a movie theatere playing Om Shanti Om in 20 mins! So we got tickets and popcorn and saw it. very good. there's this superstar and his girlfriend shanti. But then when shanti gets pregant, Om who likes her tries to save her because her boyfriend set fire in a building. Om dies in the hospital but shanti dies in the building so her ghost stayed in there (you may not guess why a ghost has to do with this but your wrong). Om though dies as soon as the man who killed him (his wife) had a baby. so Om got reborn! the man who killed Shanti was still alive and they wanted to spook him so they took this girl who looked like Shanti and wrote a SMS to him then girl looked up and she was evil! Then they wanted a girl for the song or movie Om Shanti Om and the girl who looked like Shanti took the job! Then they had a party at the place where Shanti got killed. The ghost though apeared, this time invisible, and set fire! Luckily they got out okay thought and then they showed movie he made before he killed Shanti but when the girl looked up it wasne't Shanti. Then they had a big party and the ghost of Shanti appears and kills the man who killed her! the fake Shanti apologizes for what she did and they married. The End. Then we went to Pizza Hut and had dinner. Good night. November 22 "Two Malls and Another Movie"
November 23 "Another Mall and Saawirya!" Today we went to another mall to by movie tickets to Sawirya. Then we bought me a new t-shirt that said Girls Rock on the front. then we had subway for lunch and went to a bookstore. after that we saw Saawairya. really hard to understand though. After that we went to our Epire hotel reastrant, gross men staring at me and mommy and no good food, then we looked at Cocoa grove, nobody three, then we went to a rolls place, just pop. so then we finally just went to Ruby Tuesdays. 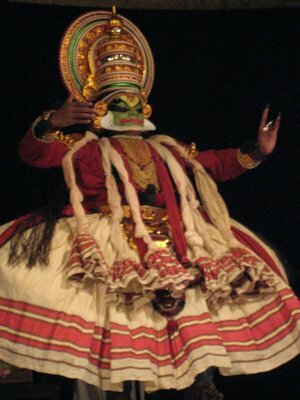 "Canadians who don't speak Kannada"
Paradise Lost! One minute we were poolside, the next we were sweltering in an airport departure lounge with no AC or fans. Spice Jet, however, eventually did the job and delivered us to Bangalore. We were delighted to see our (unconfirmed) airport pickup to take us to the hotel. It was nothing special, but not horrendous, and it had a nice Indian buffet breakfast included. Then we were off again, by train, to Mysore. This train, and train station, made for a much nicer experience than our Agra to Delhi trip. In Mysore, we even got a tuk-tuk to the hotel (with a proud driver who crammed all our luggage into his new - "six months!" - tuk-tuk). So that was all very simple and pleasant for traveling India independently. We should have known better. Perhaps it was our good mood, or our reluctance to offend, but we said "yes" to a cheap hotel room (Hotel Dasaprakash) that bordered on appalling. Within a few minutes, we said "five nights here?" Then we walked around downtown Mysore. Within a few minutes, we again said "five nights here?" We went back to the hotel and informed the clerk we'd only like three nights. "No problems," he said with the standard head bobble. We hadn't paid anything yet anyway. The problem was that Mysore looked like Agra but without the famous monuments. Or Delhi without the modern conveniences. Sure, Goa was different, but here was our first south Indian city and it had all the worst features of the north: dirt, smoke, dust, public urination, hawkers, aggressive people, stray dogs, and...more dirt. Many people said the south is different, but I guess this isn't south enough. 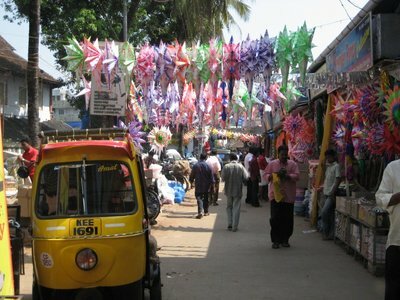 What drew us to Mysore, originally was the image of the famous market with the brightly coloured dyes. So I guess that's a pretty stupid plan for five days: stare at brightly-coloured dyes, but we also read about the palace, and the "grand, leafy avenues" making it "pleasant to stroll around" (Rough Guide). You have to read between the lines and use a LOT of imagination to get that out of Mysore. But they couldn't just write "EEEEEEEEWWWWW" and fill a thousand-page guidebook. So then we started thinking: where to go? Eventually we settled on not changing our flight from Bangalore, and going back there for three nights instead of a one night layover. Jenn was at a low point for the trip. We were only halfway through India, and only two days out of Goa, and she couldn't bear the thought of another month if it was going to be like Mysore. Certainly, wherever we went, we'd have to be in a better hotel. We'd paid $37, ironically the same amount as Hotel Orchid in Hue (Vietnam), which was our favourite place to stay on the whole trip. Anica and I were feeling a little more upbeat, and Jenn plugged away at the choices both online, and in the Rough Guide, lining up some good options. She is amazing, though, because I know she was pretty down about how things were heading, but she worked through it. She came up with a whole bunch of new options to add variety and comfort to our remaining month in India. At one point, Anica said "but we have a nice hotel" in response to something we'd said, and we just stopped and stared at her. I think she meant: we were together, and there was a TV, and she was getting to watch an 8:00 movie every night. It couldn't have been the cockroaches she liked, or the bucket shower, or the peeling paint, or the buzzing flourescent tube-lighting, or the bathroom window open to the street or the...hmmm, why had we agreed to stay there? One lesson is this: India is not cheap. It can be, but you get what you pay for. 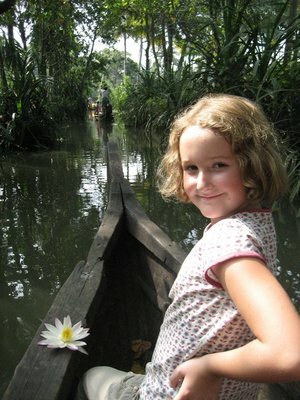 In Vietnam and Thailand, you can get gorgeous, clean accomodations in any price range. So, as I quoted once before, "other than that Mrs. Lincoln, did you enjoy the play?" We did have some fun and saw a lot in Mysore. 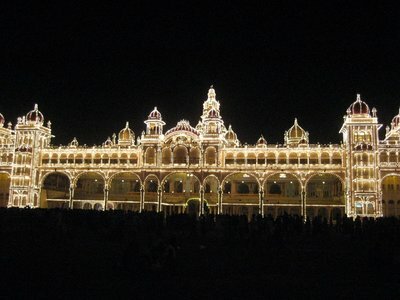 On the first night, we were lucky that it was Sunday, the only night that the Maharaja's Palace is illuminated. If you've ever seen Harrod's department store at night, picture an Indian palace lit up like this (or, for Torontonians, picture Honest Ed's). It's a lovely occasion, where the gates are opened and all are welcomed in for free. Local families sit around on the lawns and stone piazzas, waiting for night to fall, having snacks, and chatting. Then, right at 7 PM, all of the 5000 lights come on. We looked at it from all angles, and also the other buildings and gates that comprise the Palace, also lit up, then walked back to our hotel. That was the only problem with that evening: the hotel. 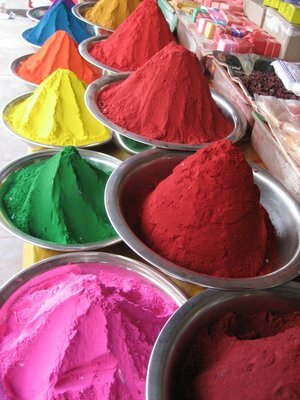 Earlier in the day, we'd gone through the market, and seen the famous dyes, which were indeed quite colourful. On the second day, we spent even more time in the market. I found it fascinating. Along with Qingping (China) and Karauli (Rajasthan), this was the most vibrantly exotic market I've seen anywhere in the world. In particular (no, not the dyes), the flower-selling got my attention. The flowers are sold in garlands, out of raised, unlit stalls. The whole process seemed to be men's work . Most of the stalls had men of all generations plucking the flowers, stringing, and selling the garlands. And with all the goods sold, there was a rhythmic singsong chant to go with it, often a call and return between stalls. Outside that market, one man, who worked at a movie theatre that showed movies in Kannada (the official language of the state of Karnataka), suggested we go see the incense makers in the other craft market. Then we were chatted up by another man, who was on his day off from selling "eight to twelve kinds of bananas". He took us directly to a traditonal incense and oil makers' shop, the kind of quasi-ripoff "help" that comes in the guise of a new aquaintanceship. But that's fine, because it was an interesting process, and the man who explained aromatherapy oils was quite a character. We managed to exit having only bought a tiny, overpriced bottle of water lily oil, which is supposed to ward off mosquitoes. Anica was fearlessly taking pictures of everything and everyone with her new camera, and seemed to enjoy her first days in Mysore for that reason. To get out of walking around central Mysore, which we figured was the busiest, dirtiest part, we booked a full-day's sightseeing with a car and driver for our last full day. It turned out to be a good move, because they had a whole list of things, and we just said yes or no to whatever the driver suggested we see next. A couple of the places were many kilometres outside of Mysore, so the car was really worth it. There was the Chamundi Hills, with its winding road up to it. It is the 3400 metre hill that is visible even from the middle of Mysore. Although shrouded in fog, we enjoyed the ride. On the way down, we saw the black Nandi (bull). This is a 5 metre high statue of a bull 500 years ago carved from a single piece of black granite, and a shrine. I accepted the blessing (or in this case...bullseye?). Even farther out of town was K.R.S. Dam and Brindavan Garden, where there was a children's playground and many water fountains. Not fantastic, but pleasant. It also meant driving through towering fields of sugarcane, and intensely green rice paddies. 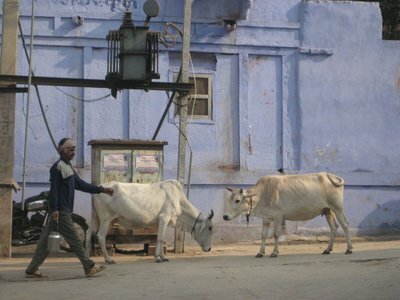 The countryside, then, was nothing like Rajastan. A couple of the other stops had to do with Tippu Sultan, the most famous "Tiger of Mysore," who defeated the British twice, before losing in the 3rd and 4th Mysore Wars. He was killed in the last one, and we saw his tomb (called Gumbaz), where he's buried with his mother and father in a domed vault painted in a variety of tiger-striped motifs. We saw his summer palace, where every inch of every wall is (was) painted. The grounds are kept very nicely there. We saw where he was killed in battle. The driver, who didn't speak much English, pulled over, showed us the plaque, said "ok?" and then started driving again. He was right; there wasn't any reason to stay longer to look. As for the city sights, we'd got to see the Maharaja's Palace on the inside. It's well-preserved, and very beautiful, particularly the stained glass, and the wall murals showing a procession from 1931. The palace was rebuilt after fire from 1897 to 1912, so it's not too old. There are many European elements to it. Speaking of European influences, we also saw St. Philomena's Church, which is impressive enough for being a novelty in India. So that was quite a full day! We just kept going and going, from 8:30 AM to 5:00 PM until we finally said: take us to "Pizza Corner," (an uninspired, but safe choice - Mysore had good prices for food, but nothing great - we had all Indian cuisine, except for Pizza Corner here) and then told the driver we were done for the day. We would be out of Mysore in the morning. One more night in Hotel "Disasterprakash!" Nov 17-18 "Bangalore one day and Mysore the next"
Today we got up and had a very yummy breakfast of toast with nutella and a hot milo. Then watched amazing race on AXN (very enjoyable). Then we went swimming for 2 hours! (we also read two chapters of Harry Potter non stop!) Got changed and did my diary. Had lunch of grilled cheese sandwich and one bag of chips and a wowie (diffrent choco bar with disney characters). played nintendo, did my homework, watched tv, then took drive to airport. (very hot). We got on a (delayed) spice jet flight to Bangalore. We got to bangalores airport and saw our driver got to hotel checked in and went to bed. Nov 18 "Train from Bangalore to Mysore"
Nov 20 "A Tour of Mysore"
The company we booked our villa with in Cavelossim, Goa, is called "Lazy Days." We took the name to heart. For ten mostly sunny days, we did nothing in Goa other than just sit by the pool or beach and relax. Even our nearest internet access was almost a kilometre away, and therefore not so tempting. We had a lovely two-bedroom villa, with a patio out back, in a quiet enclave of such homes called "Luisa-by-the-Sea." Many of the homes there are people's permanent residences. Some live there six months a year, and they're vacant during the monsoon off-season. We were part of a ring of homes that backed onto a large swimming pool. Just sitting in our backyard, we felt like we were bird-watching. The variety of birds - exotic, at least to us - was astounding. Other than our accomodation, we got by on about $20 a day by eating out only at dinner. The kitchen was fully equipped, and we didn't even have to wash dishes, as our price included 2-3 hours of maid service every day except Sundays. Linda, our wonderful maid, even did our laundry for us by hand during that time. Plus she was a very sweet person, who took an interest in Anica, being a mother of five herself. We exchanged addresses with her when we left. Linda was quite confident we'd be back in Goa again, of course. That seemed to be a theme wherever we went: "is this your first visit to Goa?" The beach was spectacular: wide, clean, miles long, with clean, shallow water in which to wade, soak, or be knocked about by waves on rougher days. Although it was only a five minute walk from our house, we didn't go every day. For one, the pool was so nice. Also, the pool didn't have hawkers. The beach did. They had little stalls on the paths across the dunes to the beach, and there were strolling hawkers on the beach itself. If you stayed in the water, you were left alone. Otherwise, they'd chat you up, learn your names, and try to extract a promise of a future purchase. It was hard on us, because we had no intention of buying anything. We're travelling too long to buy a t-shirt or sarong at every stop. Just as proliferate, thankfully, were nice restaurants. There were a couple on the next street over from Luisa-by-the-Sea, where we hopped a fence as a shortcut to get there. A nice one was "The River View" so named because Cavelossim is a strip of land between a river and the sea, and "The River View" is built out on a dock overlooking the river. Another is called "The Beach Hut," and I'm sure you can guess why. The main street is also lined with restaurants, and stores such as D'Mello's, where we bought most of our groceries. Another feature of our villa was its inverter (or automatic back-up generator). Power outages happen several times a day in this part of South Goa. The first time it happened we had too many things switched on, and the inverter didn't work. Another night, during a spectacular, lengthy lightning storm, we conserved the back-up by just using candles. Using a flashlight, we went creeping down the darkened main street until we came to a restaurant that had on its backup power. Knowing that the villa had a DVD player, we had stocked up in Delhi with (pirated) DVDs. Most of these actually worked just fine, so that we watched a movie every evening. Anica did more work on math and spelling than she had been doing, mostly cheerfully, and Jenn and I devoured novels. I'm reading aloud the Harry Potter series to Anica and we're into the third book now. On Anica's birthday, November 8th, the Lazy Days people really helped us out by having a birthday cake delivered. The woman who manages the place, Lynn, also gave Anica a card and gift of a diary that's hand-decorated. The other manager, Sammy, came by with his wife and gave Anica flowers. We'd got a couple of gifts for Anica in Delhi, included a digital camera that was from her Nana and Grandpa as well. We watched the first Harry Potter movie that night, and Anica declared it a great birthday, especially with the phonecalls she got from her grandparents (we had a local landline that could take incoming long-distance calls). We were able to enjoy her special day, comfortably, and be able to do her favourite activity: swimming! 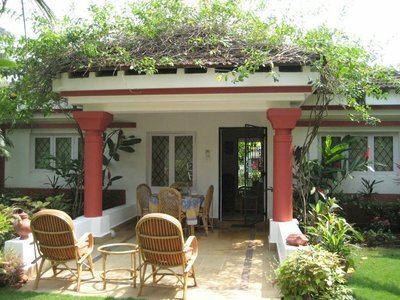 Having decided to spend a little more time and see a little more of Goa, we headed just up the road to Benalium (actually, it turned out to be Colva), where we stayed at the Sandray Resort. 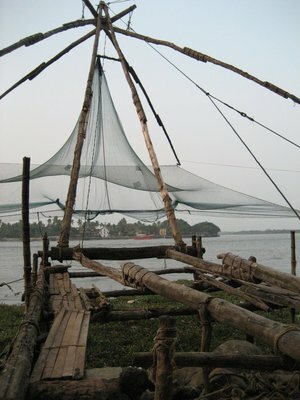 This allowed us to spend a few more of those relaxing days in Goa, but at less cost. The Sandray ran us just $32 a night, for a two room suite with kitchen facilities. It has just five suites, which surrounded a small, but lovely pool. After adjusting to our new digs, we really enjoyed being there. We knew it wasn't near the beach. 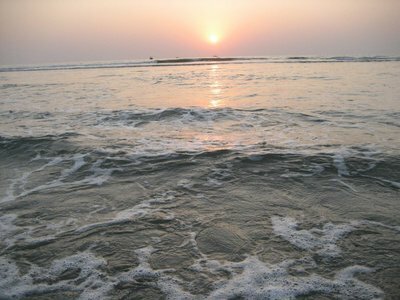 In fact, we ignored the over-crowded Colva Beach, and instead, just once, took a cab to Utorda Beach. There we had dinner at "Zeebops," right on the beach, joined by Nigel, another Sandray guest. Everyone at Sandray seemed content to just sit around the pool, reading and sometimes swimming. That's about all we did, other than helping Anica with her schoolwork. Anica swam so much her hair's tinged green in parts. We mostly made our own meals, helped by a local grocery store called "Sho-Faz," and a bakery called "Dalima's." These were just a couple of blocks away, yet that still took us past yards with water buffalos, pigs, cows and goats. It was a nice reminder we were still in India. The resort, despite being so tiny, did have its own restaurant, and we had a couple of meals there. Basically, Goa was just what we hoped for: a place where we just slow down and unwind for a couple of weeks. We got on a plane by Go Air which is not Goa's airline! Got to Goa ad 1 hour drie to villa. got there ad looked around to see pool, 2 large bedrooms, tv, dvd player (heaven). We went swimming, had dinner, watched Underdog. Good night. Today we went swimming two times and dipped our feet in the beach. after lunch I watche Barbie of Swan Lake. 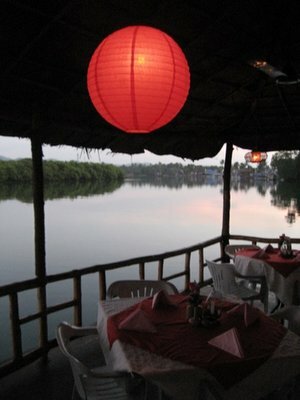 Then had a beatiful river veiw Dinner. Good night. Our pool in goa is big, warm, and very colourful. One end is very shallow and one end very deep. We go swimming 2 times a day. Our pool in goa has beatiful dark and light blue stripes, with two ladders at one end, ladder and steps at shallow end. It's surrounded by big palm trees (not to mention a toy winnie-the-pooh stuck in one). Also birds, bald eagles, and many other birds that I don't know the name of. One day we saw and heard jets. We just love it so much that we go swimming 2 times a day. Today I got up and had hot Milo and tosat with butter for bresfast. Nana & Granpa called [yesterday]. Happy birthday they said. Then Poppa called too. Also the owner of the villa bought me a diary and flowers and a card, and our maid Linda gave me a card to. Then I opended presants from Mommy and Daddy. I got a Barbie Mermaidia play makeup set, Abracadabra (a 70 trick magic show), a big card, and a Harry Potter gameboy and an art techer Barbie set. But then the most best presant ever A CAMERA. So even though told getting two, I got 13 encluding cards and calls. Wow! Went swimming and had lunch and watched Sinbad. Had cake with candles that do colours. Then had dinner and watched Harry Potter and Philophers Stone. Good night. We went on a walk on Nov 9 down to fisharmans warf. on the beach went in on the Leila, another resort. washed our feet off and had a good dinner at fisharmens wharf. One day we went to the beach and did wave surfing and played around. One night there was a power outage forever. almost six hours! We used the flashlight to get to a restaurant with power. One day we tried 2 movies before we could find one that pourply worked!!! Then the last one got attacked by thunder! One day we took a interesting drive to Sandray and saw our room. big table inside, and out side, small kitchen area, living room, pool, DVDs. One day we took a taxi down to the beach and played and saw lots of interesting shells. Mommy picked one up with a crab in it and me and Mommy picked up some starfish. Had dinner with friend named Nigel and went to bed. One day we went down to a shop called Sho-Faz and it had everything! One day we went down to a bakery and got veg samosa, butter and chocolte cookies for dinner. The pool is big with jacuzi and children's pool, waterfall out of jacuzi. and games we play are monkey in the middle, water bowling and lots more. "City Palace and Hindu Girls"
Today we saw the city palace, very preatty, and many stairs, very preatty. Then we walked back and had a very yummy tomato soup and pakora and French freis yum! Then we rested for a bit. Mommy, Poppa, Daddy and I think Manu slept to. but I read a comic and Harry Potter and two mystry novels. And today was the first time I did a camel cart ride! Very fun, we went to a lake and I played with Hindu girls and I ripped my pants Then we had dinner and went to bed. Today we went on the most boring drive to Agra. On the way to Agra we stopped at a Natinal park very pretty. We saw many birds, Jackels, mother and baby deer, wild boar and piglet. After had pakora and French freis, very salty. yum. then saw a city very preaty and very old, many carvings [Fatehpur Sikri]. Finally we got to Agra and got stuck in a big traffic jam, a bus messed up our windshield things, got checked in and had dinner. Good night. Today went to the Taj Mhal, not busy, very pretty and very neat. We went with a local Tour Guide but we diden't use him to much. after 2 hours we went back to hotel and had Breakfast. Read for a bit and went swimming, big water slide. Then had lunch-dinner, got on train and we got to Delhi and went to bed. good night. Today we ended our tour and gave Manu our cards and said goodbye. Walked to Florence Inn. Got checked in, and rode Metro to Connaught Place and went to bookstore and had lunch at Thank God It's Fridays, went to bazer, got movies for Goa and had dinner with Chris, Rachel, Fin, Sadie. Good night. We went to a mall and we went birthday shopping. We got me a Harry Potter and the Philosophers Stone Gameboy and an Art Teacher Barbie set and 2 other (secret) presents. We had lunch at McDonalds and we saw a pretty Lotus Temple. 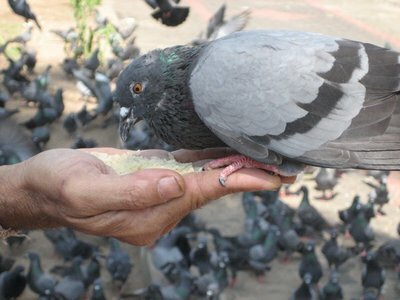 We went to Connaught Place and looked around. We had dinner. Good night. Today we said good bye Poppa and gave him a hug. Then we took the metro to India Gate and saw the Delhi Museum, very nice. Took Metro down to Connaught Place and had lunch at TGIFridays (yum). Looked in a bookstore and got money from an ATM, went back to hotel and had dinner. Good night.